What are FR Faves? Basically anything that I'm currently crushing on! Home decor, accessories, beauty, splurges, steals, things I never leave home without. Just fun stuff I occasionally like to pass along to you guys. Hope you enjoy! Since having kids and putting the diaper bag-stage behind me, I've opted to carry a smaller wristlet or crossbody every day, but I was always frustrated because I couldn't find the perfect purse-wallet combo...until now! 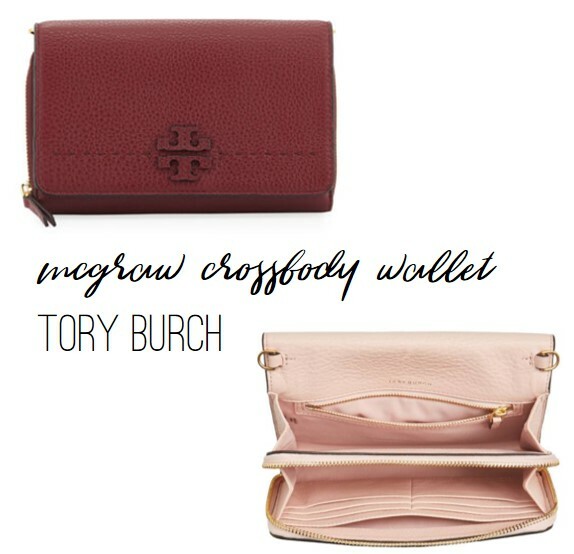 The McGraw Leather Crossbody Wallet by Tory Burch is exactly that...a roomy and spacious wallet with a separate compartment that is large enough for your phone, chapstick and any other small essentials. You can detach the strap and use it as a traditional wallet or use the strap and turn it into a cross body. I linked it above in a fresh crop of spring colors, but I have it in Imperial Garnet, which I also love! I'm always on the lookout for cute things to add to various shelves and surfaces in my home. I couldn't pass up these Blush Gabriella Vases from Magnolia. The subtle pink color would pair great with metallics and the small size makes them perfect for tucking blooms all throughout the house! My hands get so dry in the winter...like, they crack and start to hurt terribly. Ugh! Kiehl's Ultimate Strength Hand Salve has a permanent place on my nightstand during this time of year. I put it on right before bed and it works its magic overnight. My hands feel way better by morning! I buy Aquaphor in the travel-sized tubes by the gross. I literally have one in every bag I own, in every bathroom of the house and in my car. I cannot be without it! I use it daily as chap stick, but I've also used it to soothe cuts or boo-boos and even to tame flyaway hairs. Cheap and effective...win-win! #4SquareStyle: Kicking Off the First Round!